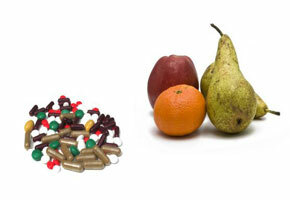 Minerals are often clumped in with vitamins as something that is necessary for your body’s optimum health. In this sense that definition is true: minerals are necessary for optimum health. Many minerals are even considered essential minerals, as in the human body must absolutely have them to survive. So what exactly are dietary minerals? Dietary minerals are the chemical elements that your body requires to live (as do most living organisms) that are present in most organic molecules. Translation: they’re the chemicals in your body and the bodies of most animals that keeps everything functioning the way it should so you can live happy, healthy, and normal. The actual word “mineral” confuses many people, and it’s an archaic term from a time when science didn’t understand the functions of the body as fully as they do now. #1 Calcium: Everyone knows about calcium, which is used for muscles, heart, and building bone. This mineral is where dairy products shine. #2 Chloride: This is what produces the acid in your stomach, and is mostly acquired in your body through the intake of salt. #3 Cobalt: This is also known as vitamin B12 and can be found in concentrated supplement form. #4 Copper: Copper is a critical part of many enzymes that the body needs to function a full capacity. #5 Fluorine: This is related to the word fluoride, which more people will be familiar with. This mineral is what allows tooth enamel to form, allowing us our ability to chew food and eat. #6 Iodine: Iodine is the mineral required for thyroid regulation. An iodine deficiency is what causes goiters, which are often a problem in older age. #7 Iron: Protein may build the muscles, but iron is what makes the protein work. Iron is one of the most essential of the minerals of the body. #8 Magnesium: Required for bones, this element tends to decrease in older age. #9 Manganese: Think of this mineral as an enabler for enzymes. #10 Molybdenum: Works with oxidation of cells in the body. #11 Nickel: Helps strengthen bones and keeps them healthy. #12 Phosphorus: This mineral is another part of keeping bones healthy, but phosphorus also helps the body create energy, and also assists in a wide array of other functions. #13 Potassium: Potassium is actually an electrolyte that is extremely important in keeping the electrolyte count balanced and using sodium and water with maximum effectiveness. #14 Selenium: This mineral is the ultimate enabler of antioxidant enzymes in the human body. #16 Sulfur: Critical in working with certain amino acids in the body. #17 Zinc: Zinc is one of the most important minerals and works with several enzymes to keep the boy healthy. These are the seventeen essential minerals that help the human body function, and taking quality multi-vitamins will help keep your mineral levels healthy.